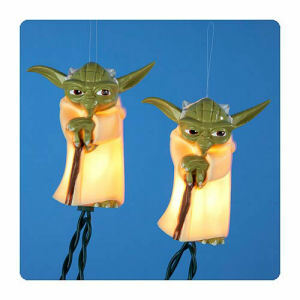 We have Just Sold out of Star Wars Plastic Yoda Full Figure Light Set. This Item is unavailable at present. From the Star Wars collection by Kurt S. Adler. Star Wars Plastic Yoda Full Figure Light Set. Yoda measures 3.25 inches tall.The Christmas lights set features 10 total lights spread out along 10 feet.Includes 4 spare bulbs and 1 fuse. Light Set is for indoor and outdoor use.